Grandma's Knitting Place: So you want to see Kangaroos?? 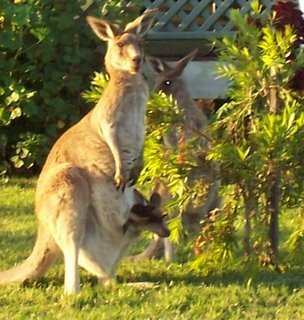 So you want to see Kangaroos?? I know a lot of my overseas friends are intensely interested in our kangaroos - and I have had questions like" Do you have kangaroos in the streets?" and "Do you find kangaroos get in the way of your car?" Well, I live near a big city, Brisbane, and no, we don't have kangaroos in our city streets, nor indeed in our suburban ones. 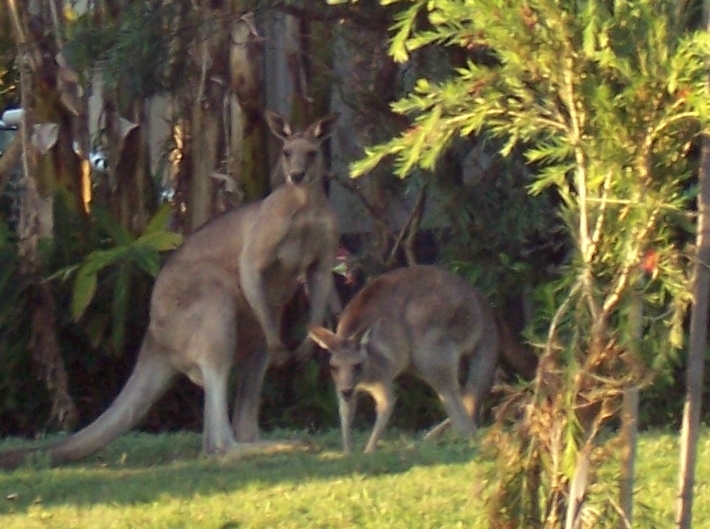 There are still little pockets of bushland in some of our outer suburbs where it is possible to see the odd kangaroo, we saw some in a small piece of parkland surrounding a new housing estate just last weekend. 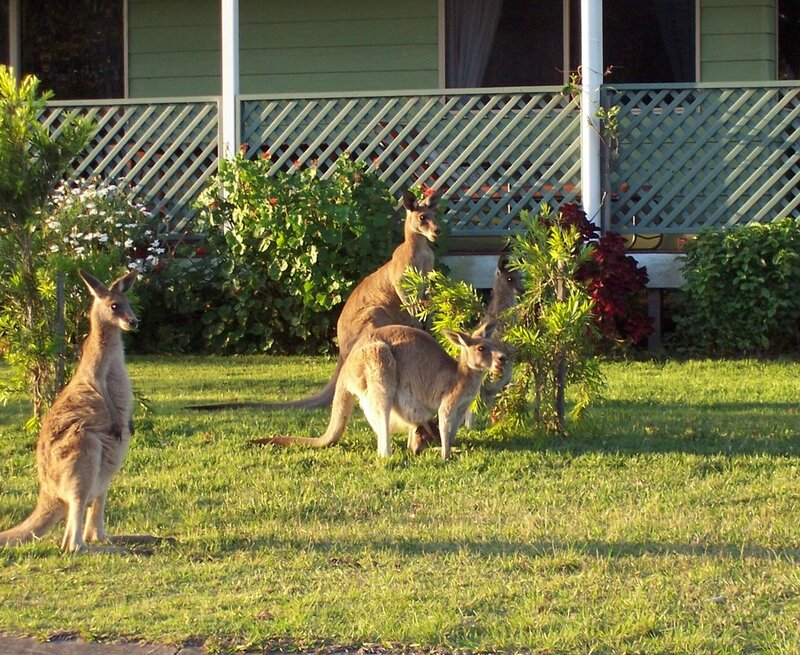 But we do have a little seaside village not 25 miles away from us, Toorbul, where kangaroos do indeed roam the streets, foreshore, and people's gardens quite freely! Here are some pics we took recently - we always take our overseas friends here - they are always amazed and get fantastic photos!! The above picture is in someone's back yard, in front of someone's backyard banana plants, the right hand one is a front yard overlooking the sea - the roos are only mildly interested in us!! As you can see this mother and baby are right in front of someone's front verandah - and not the slightest bit worried ! The town has rules about their kangaroos - they take precedence over everyone and everything - dogs are not welcome, we take ours and keep them on a leash, or in the car. Away from the houses, there is a lovely tract of bushland and woodland, and there are literally hundreds of kangaroo family groups there. 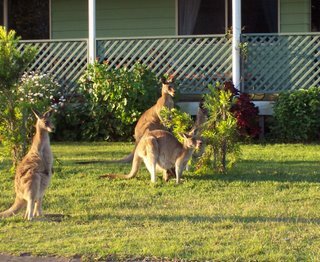 It is such a delight to see them, and Toorbul is only a mere 40 miles or so from the City of Brisbane, and about 20 miles or so from where we live.